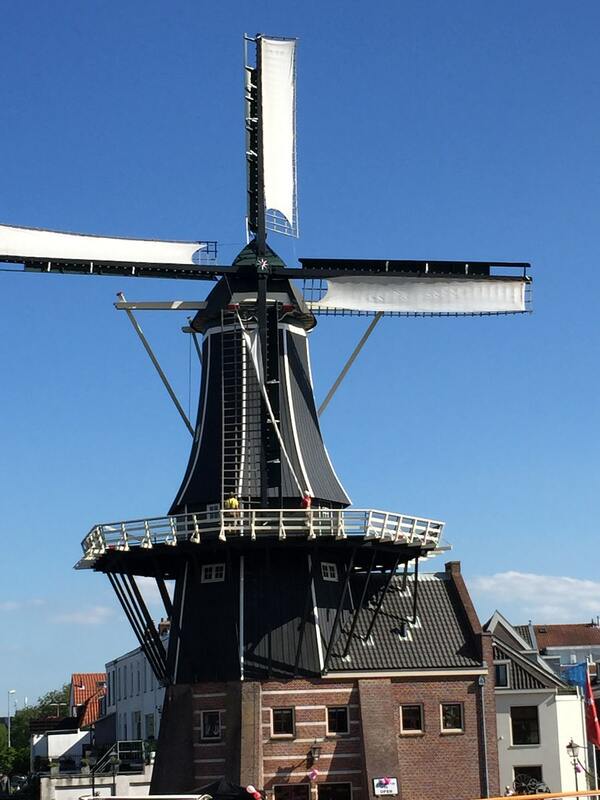 Enjoy a guided tour of the Molen De Adriaan on your visit to Haarlem. If weather permits (enough wind) and a miller is on site, the windmill can be seen in action (sails rotating). The Adriaan is open for tours every day in June, July, August and September from 13:00-17:00 on weekdays and from 10:30-17:00 in the weekend. See the section Visiting Hours for our opening hours in the other months. The old center of the town is compact, with several Parking Garages around the center. Paid parking near the windmill is available on the street (Papentorenvest). Haarlem is only a 15-minute train ride from Amsterdam, walking towards the mill is a 10-15 minutes stroll. After your visit to the windmill consider a Hofjes tocht (tour on foot) with a guide (Gilde gids). Or take a canal tour on the river and the canals of Haarlem. Or visit a museum like Teylers, Frans Hals, Corrie ten Boom. And find your way to the brewery in a former church named Jopen kerk and taste a Adriaan Wit beer! The tour in De Adriaan is about mills in general, and the Adriaan in particular. Another part of the tour is explaining how the tower and the windmill have played an important role in the history of Haarlem. 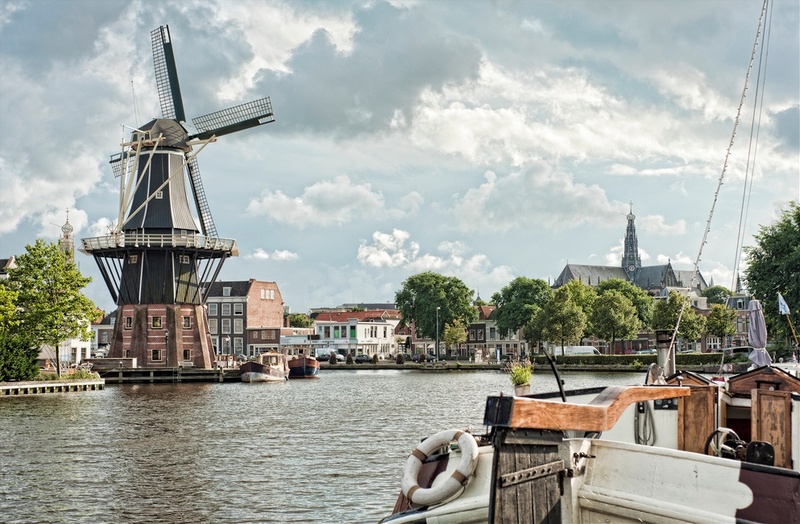 A visit to the Adriaan mill will typically take some 30 to 60 minutes and consists of the following parts: a guided tour, which takes 30 to 45 minutes and an audio visual presentation about the Spaarne river in past 300 years or a video about the windmills around Haarlem. After the tour you can buy souvenirs or post-cards and enjoy a cup of coffee/tea. 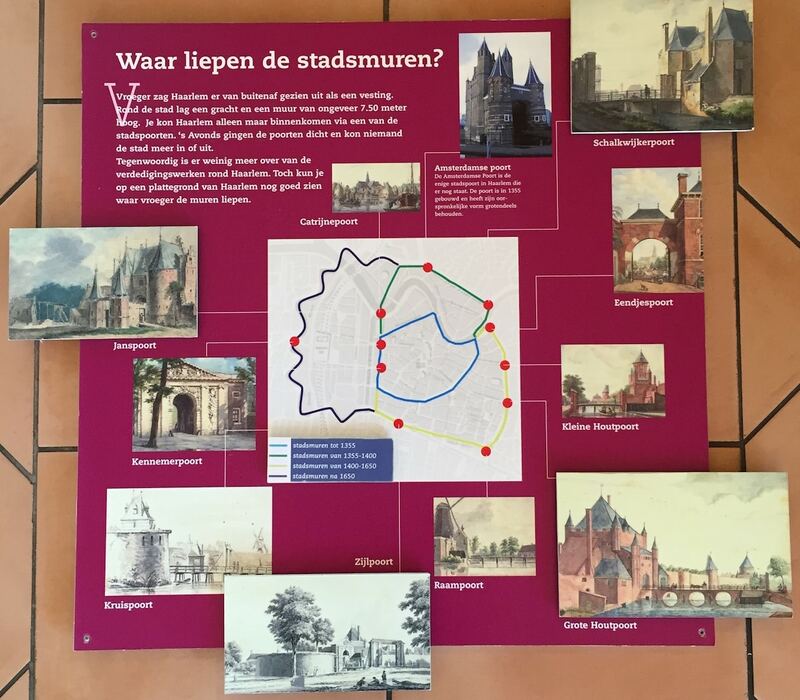 Our volunteers will tell you with passion and pleasure more about Haarlem, Molen De Adriaan and windmills in general. On rainy days and in winter when less visitors come we wait until a small group is assembled before the guide starts the tour into the mill. When more visitors are expected tours will start every 30 minutes, on the hour and on the half hour. On very busy days we can also add two tours 15 and 45 minutes past the hour. Visitors will be able to book ahead of time (by email or online) for the tours that start on the whole hour and the half hour. Visitors without reserved tickets have to wait for the first free spots. Waiting should never take more than 30 minutes. 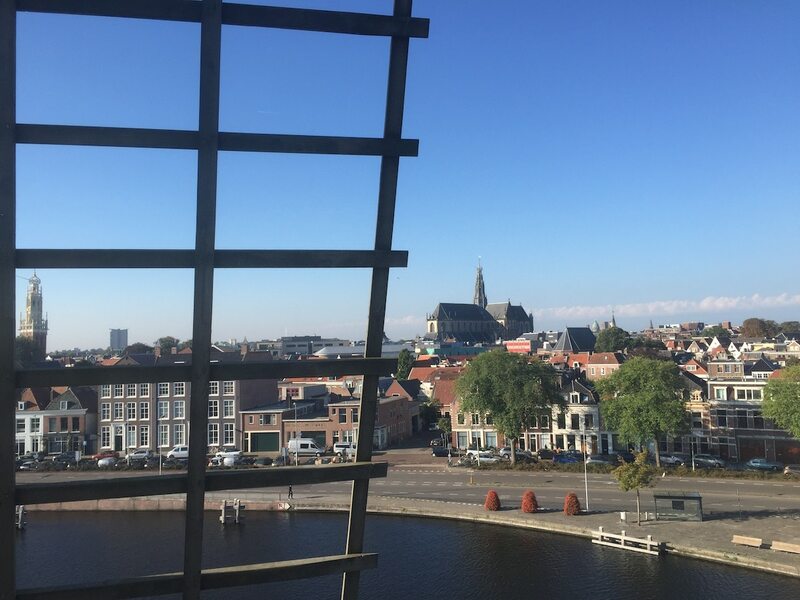 In that time the video’s on the first floor can be watched or you can take a nice cup of freshly ground coffeebeans, a cup of tea, or hot chocolate or water and enjoy the Panorama of Ancient Haarlem on the back wall. 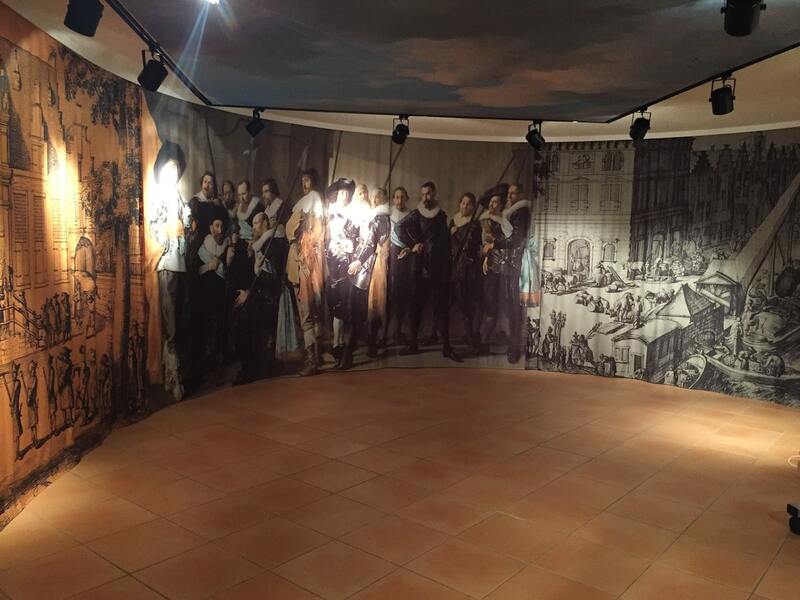 Entrance fees (including guide): Adults €5,00, children up to 4 years free; Children 5 to 12 years € 2,00. No Museum Year Card. You can pin with us.Most international debitcards with Maestro logo are accepted and creditcard from American Express, Visa and Mastercard. 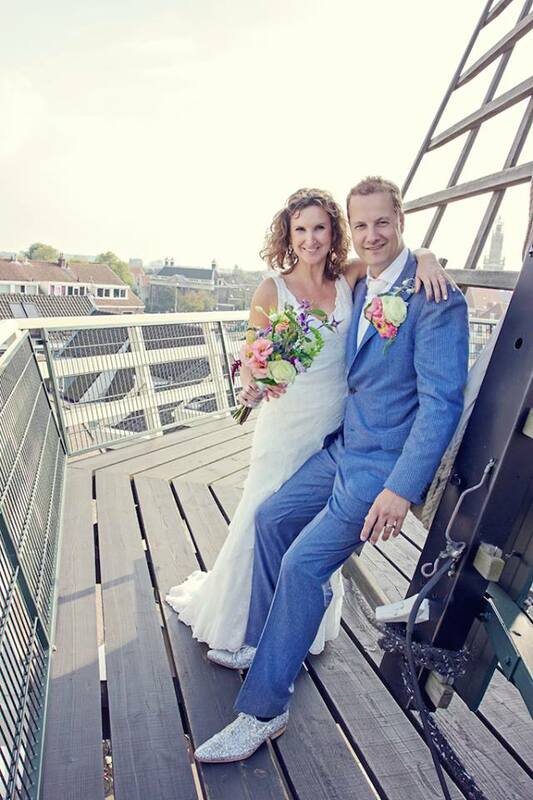 Since May 2004, the mill was Adriaan not just a mill museum, but also wedding location of the municipality of Haarlem. 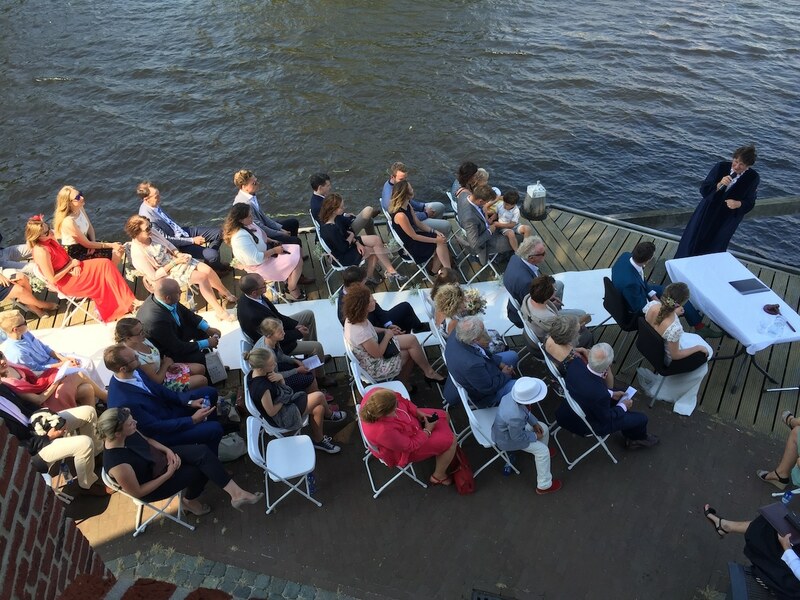 Due to its intimacy, light and romantic view over the Spaarne, the wedding hall on the first floor is a winner of many couples. 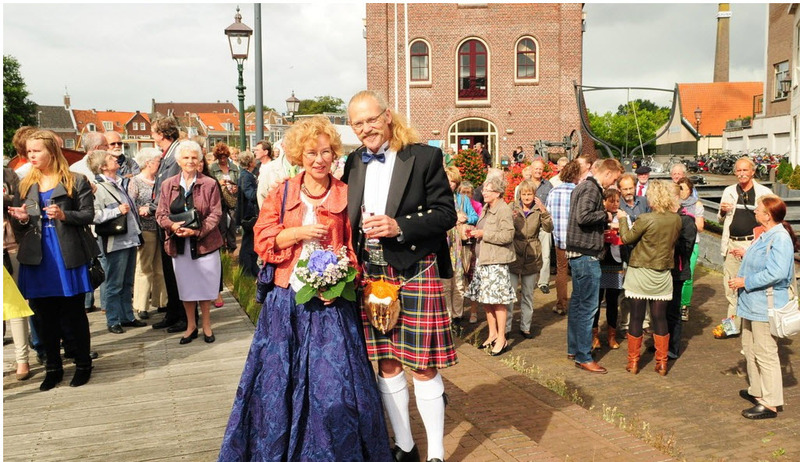 So far, more than 300 couples have given their vows to each other in Molen De Adriaan! The first floor has a seating capacity of 40 people and the seating arrangement can be tailored to your needs. A sound system is available (acoustics are really good, so no real need) and after the wedding ceremony the room can be converted to a dinner setting or whatever type of party you would like to sign up to. Please take note that your guests will have to be able to walk up the stairs to the first floor (no elevator). We have had weddings taking place on the ground floor or outside along the river (60-150 persons) or high up in the mill (limited capacity 15-20). Marriage ceremonies can take place on all working days and on Saturdays between 10:00 am and 18:00 pm. 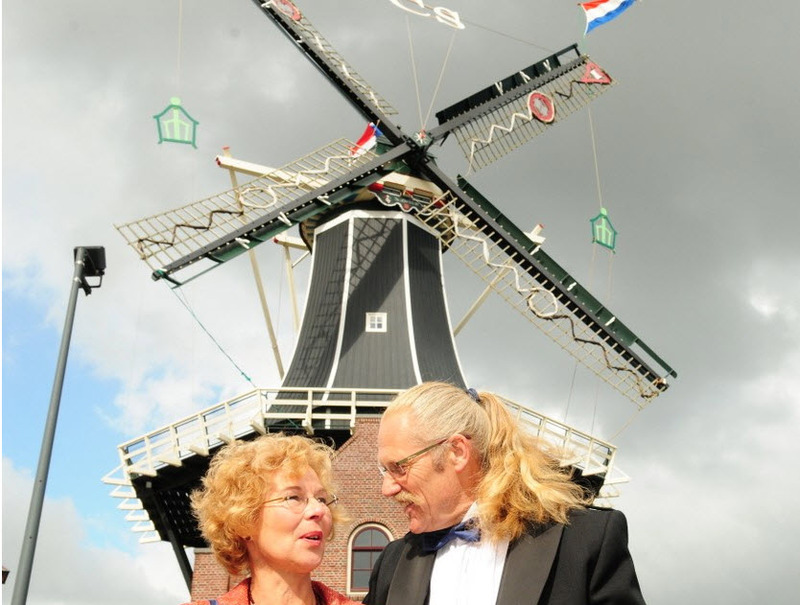 When the windmill is open to general public we limit the possibility for marriage ceremony during certain hours. Our preferred hours are Mondays, Tuesday, Wednesdays, Thursdays and Fridays at 10:00, 11:00 and 12:00 and at 16:30 and 17:30. On Saturdays our preferred times for wedding ceremonies are 16:30 and 17:30. For more information and/or for other times please contact the coordinator. The windmill is not only a wedding venue, it is open to many ideas for “something” in different areas of the windmill De Adriaan. The areas of the ground floor and first floor of the mill are very appropriate for 20+ persons. 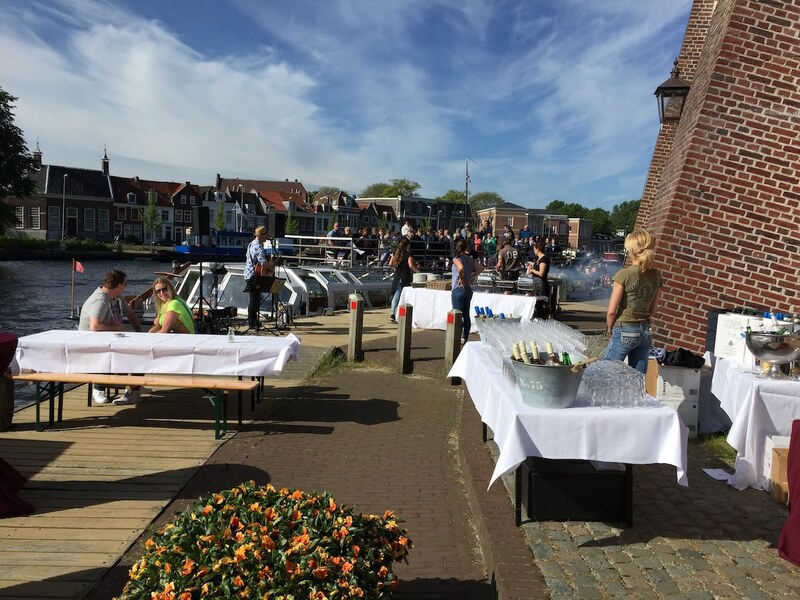 But on the deck (limited number of guests) or outside along the river with/without tent, it is all possible. 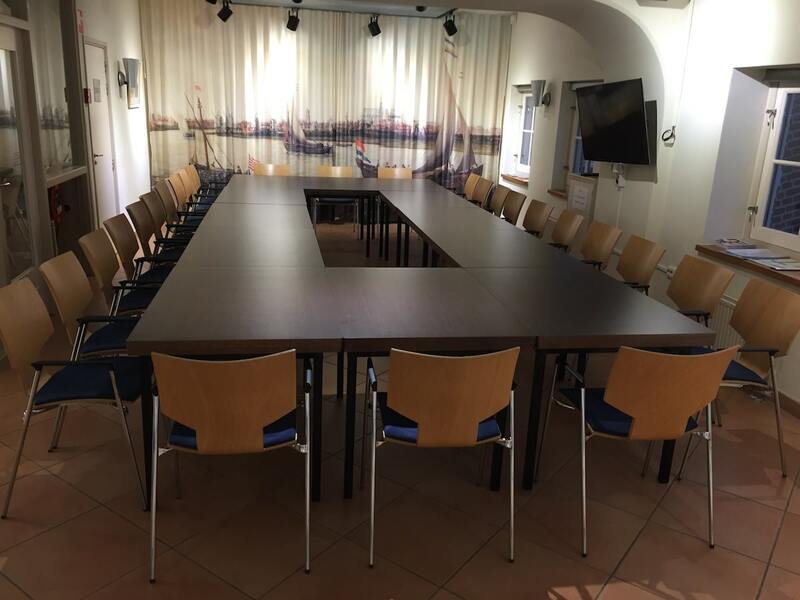 The floors can be used for meetings, workshops, seminars, presentations, receptions, lunches, dinners and parties, whether or not combined with a tour of the mill itself. Smart TV, beamers, sound system it’s all there. Come to the mill and see for yourself which areas you want for your event and discuss your wishes with the event coordinator. Together we can determine how your wishes can be realized. 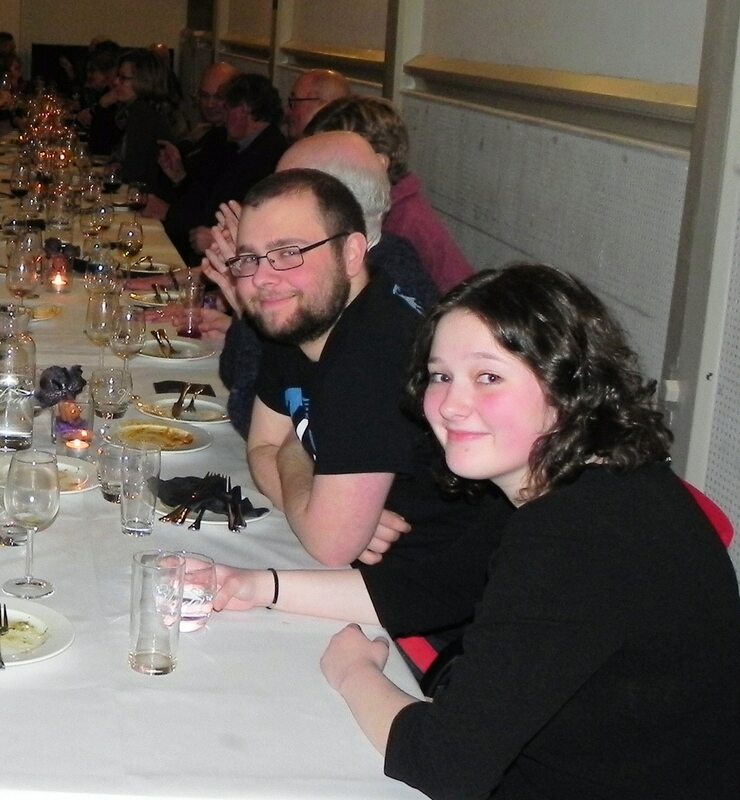 Practically speaking, we can seat up to 48 people on six-person tables on the first floor or 40 on the ground floor. For receptions and walking buffet the practical capacity is 70 to 80 people on both floors. On a nice day or with tents outside the capacity can be increased to up to 150 persons. Booking the first floor for a half or full day meeting is possible on all days, but during regular opening hours, there will be traffic on the ground floor of visitors (but not very invasive). Coffee/tea/water arrangement are available. Lunch can be arranged. 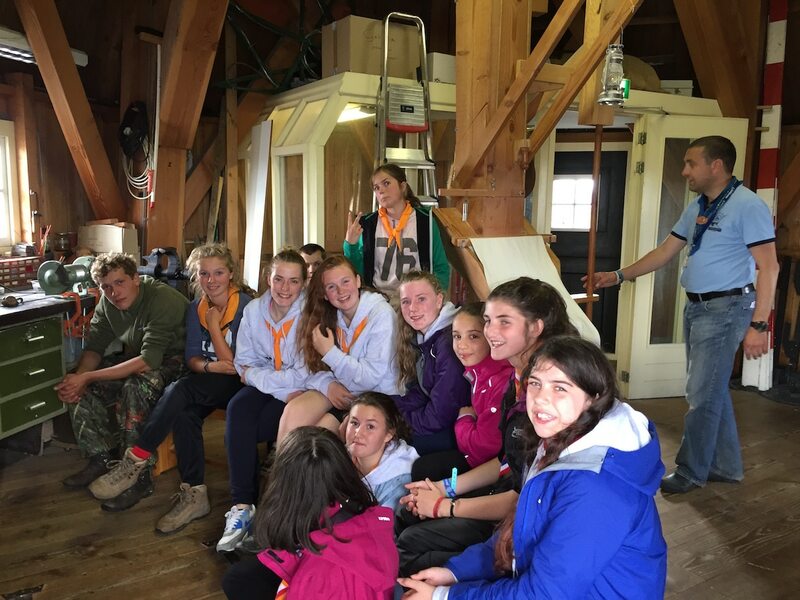 Frequently short tours to the top of the mill are arranged after lunch or the meeting. 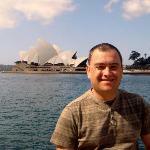 You can select to outsource the catering to one of three approved companies. For receptions, drinks, dinner, BBQ and parties please contact the event coordinator to discuss the options. 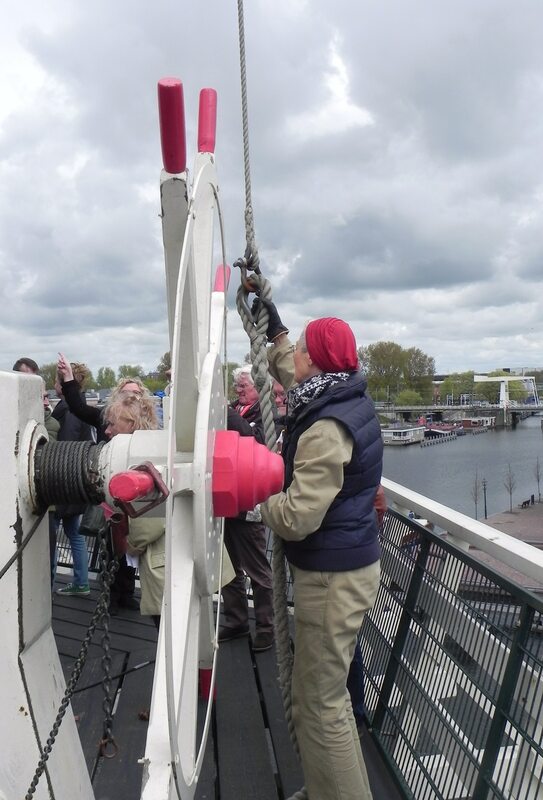 The board and volunteers of Stichting (Foundation) Molen De Adriaan (SMA) ensure all visitors young and old, from Haarlem, national and international can enjoy their visit to a full functioning windmill/museum and with a spectacular view of the center of the City of Haarlem. More than sixty 60 volunteers are assisting in several activities – mainly as tour guides or behind the counter as host(ess). Since 2002 more than 130,000 visitors have found their way to the Adriaan. Basically we always have one host(ess) and two tour guides scheduled in 4 hour shifts. We expect that the yearly numbers of visitors will exceed 20,000 very soon. On a busy day we can have up to 120 visitors per hour. These numbers can be handled by our volunteers and to the satisfaction of our visitors – if we plan the tours in a structured way. So now on regular days every 30 minutes a tour starts, on busy days we can change to a 15 minute schedule. Visitors will be able to pre-book for tours starting at the whole hour or the half hour. Visitors without reserved tickets have to wait for the first free spots, but we always reserve tickets (of all tours) for onsite sales. Every year the numbers of tourists increase and SMA are looking for many more volunteers with multiple language skills (non-Dutch native speakers no problem). 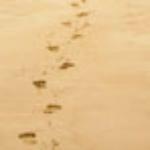 We provide tours in Dutch, English, German, French, Italian and Spanish depending on the skills of the scheduled tour guide (or assigned for group tours). We would welcome new volunteers for all positions. If we succeed to attract volunteers who can speak Mandarin, Japanese, Russian, Arabic or Portuguese that would be wonderful. As the numbers increase we are also asking volunteers to respond to the position of host/suppost. As a tour guide you go up and down the 5 stairs once every hour at least (4 hour shift). As a suppost you man one floor for 45-60 minutes, take a break and then man another floor (less strain on the legs and knees). Suppost can provide explanation to the visitors on request. 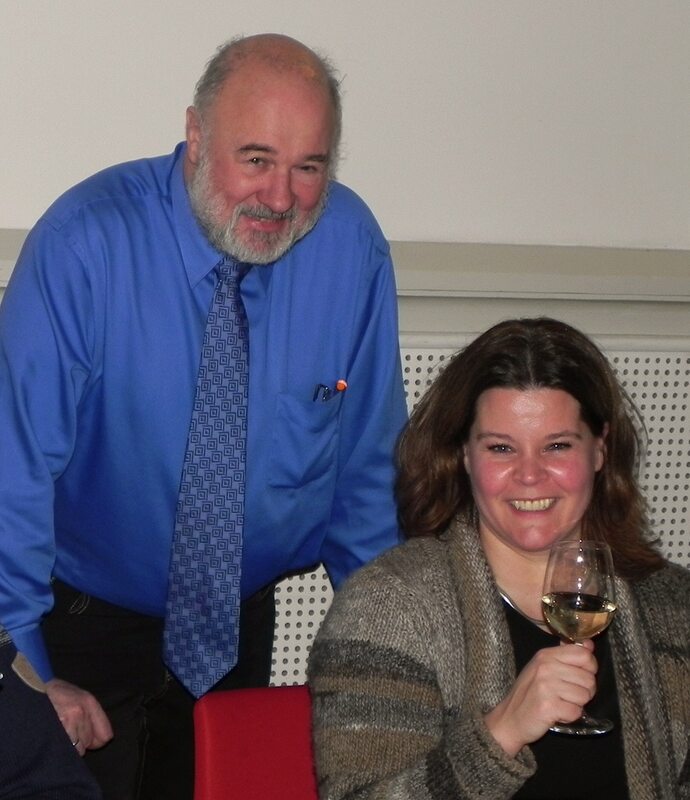 If you would like to help the SMA in a financial form, you can register as donateur van Stichting Molen De Adriaan. The proposed minimum yearly donation is € 50,-, for which you can come visit us once every quarter with one guest and yourself free of charge. 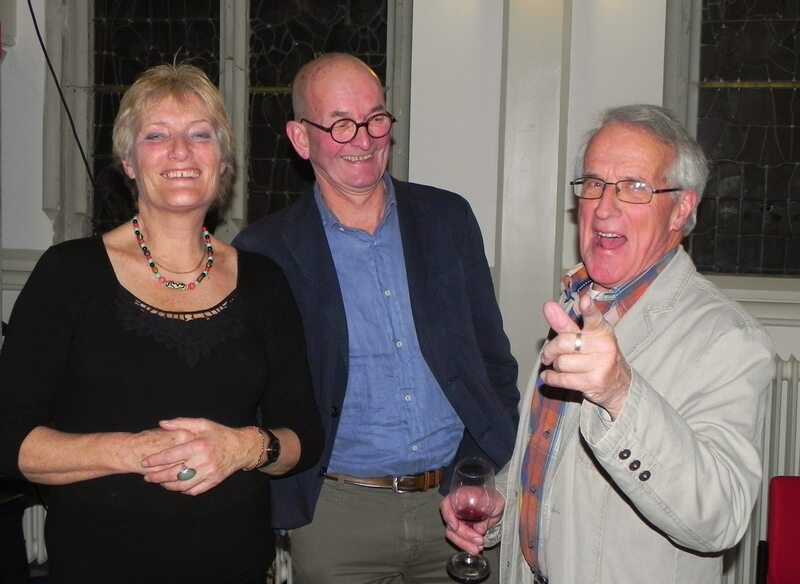 If you want to contribute your share to the educational and cultural functions of Molen De Adriaan as a volunteer or as a Friend of Molen De Adriaan, please fill in the form. For more information you can contact our chairman Mr Ted Blesgraaf by phone 023-5250468. Technically speaking the windmills in Haarlem including the Adriaan are maintained and operated by members of the Stichting Molens Zuid Kennemerland (SMZK). They have their own workshop in Schalkwijk, near the sawmill De Eenhoorn (the Unicorn). Their volunteers work there on Wednesdays. Millers of SMZK keep many of the mills turning, mostly on Saturdays. At the Adriaan we are fortunate to have more than one miller available, so on most days of the week you can see the sails rotating and occasionally we grind wheat to produce flour. As the millers are not getting any younger, the SMZK is also looking for new volunteers to learn to become a miller. If you are interested in becoming miller or want to sponsor SMZK, please fill in the form and we will forward it to SMZK or send an e-mail to secretarissmzk@gmail.com. For the next 25 years he has the monopoly for grinding tuff into Roman cement ( a kind of limestone, as we find for instance in the Bavo), of which a waterproof mortar was made. Shells for the pottery industry were ground as well. Oak-bark was ground into oak-tan for the tannery, while tropical wood was ground to powder as a pigment for the dye-industry. In 1802, after the end of the monopoly, he sold the mill. 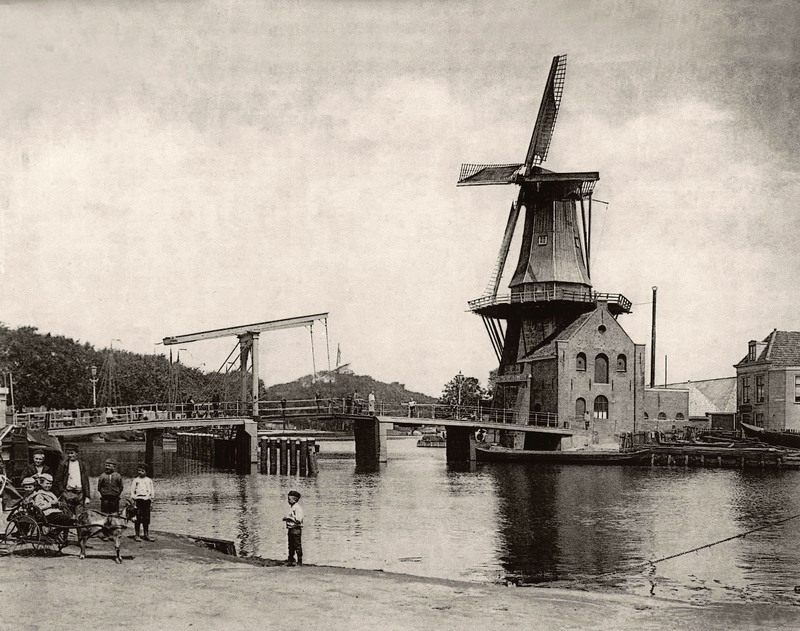 The new owner, Cornelis Kraan, converted the mill into a tobacco snuff mill. Snuff was highly popular in those days. You can still see a sign showing the mill, high above his shop where he once sold the tobacco products in the Grote Houtstraat, number 12. 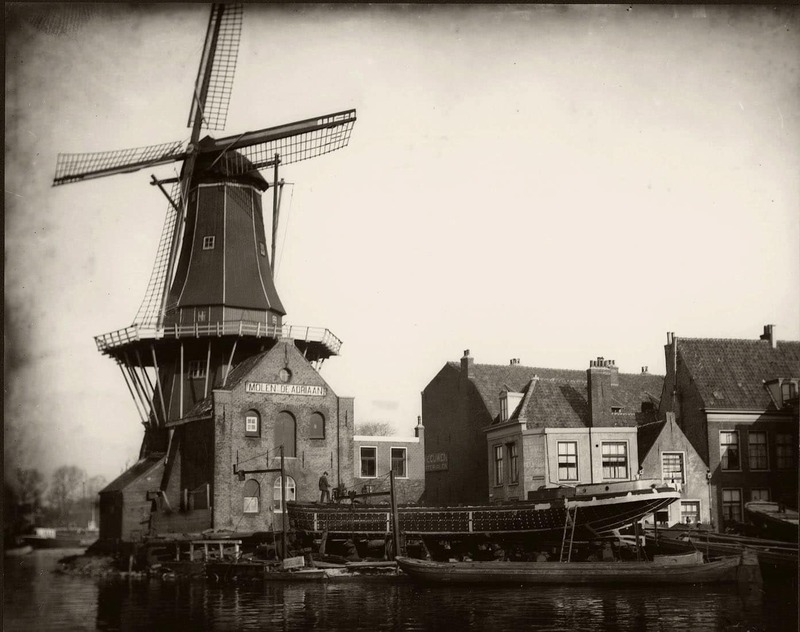 In 1865 De Adriaan was rebuilt as a grain mill and a steam engine was added, so that even when there was no wind, the mill could function. In 1920, the steam engine was replaced and the mill was driven by electricity. De Adriaan then had 5 (!) millstones: 3 operated by wind and 2 by electricity. 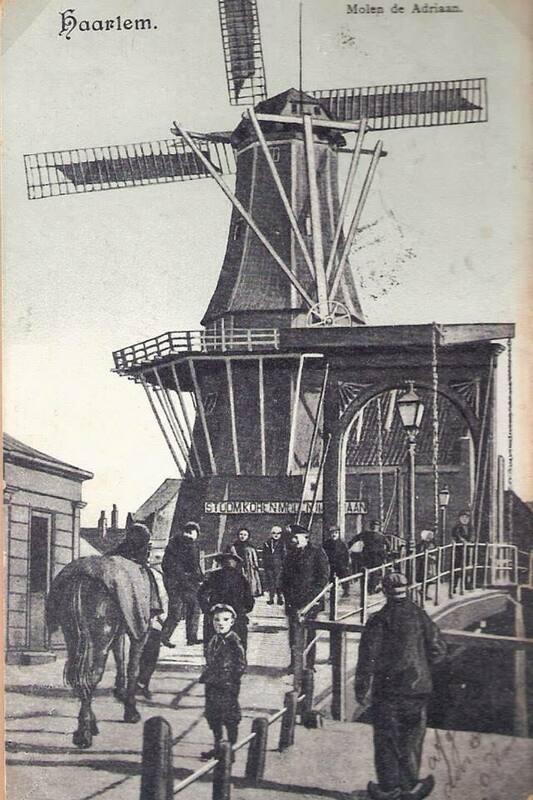 In 1925 the Vereniging “De Hollandsche Molen” (Association “The Dutch Windmill”) bought De Adriaan. It was the first acquisition of this association, which tries to preserve windmills and to keep them going. On a Saturday afternoon, April 23rd, 1932, however, the mill burnt to the ground. 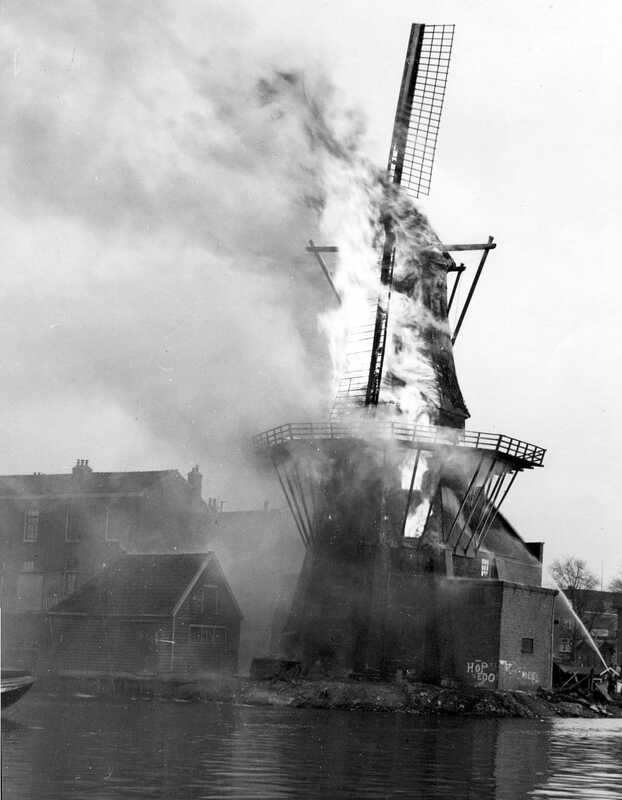 Looking at the photographs it is clear that fire-fighting material was not sufficient to save the mill and it is clear that one of the sail stocks is already missing: after a heavy storm in December 1930 it had been removed. It took 70 years before De Adriaan had been rebuilt. During that period many people tried to rebuild the mill. 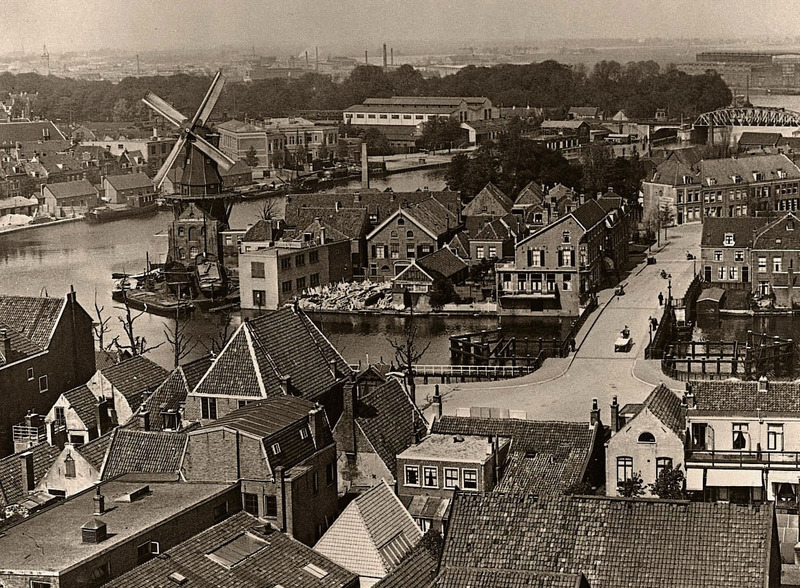 Eventually it was a document that was found again in the archives which did the job: in the past the City Council of Haarlem had promised to rebuild the mill. On April the 23rd 2002 it was a fact! 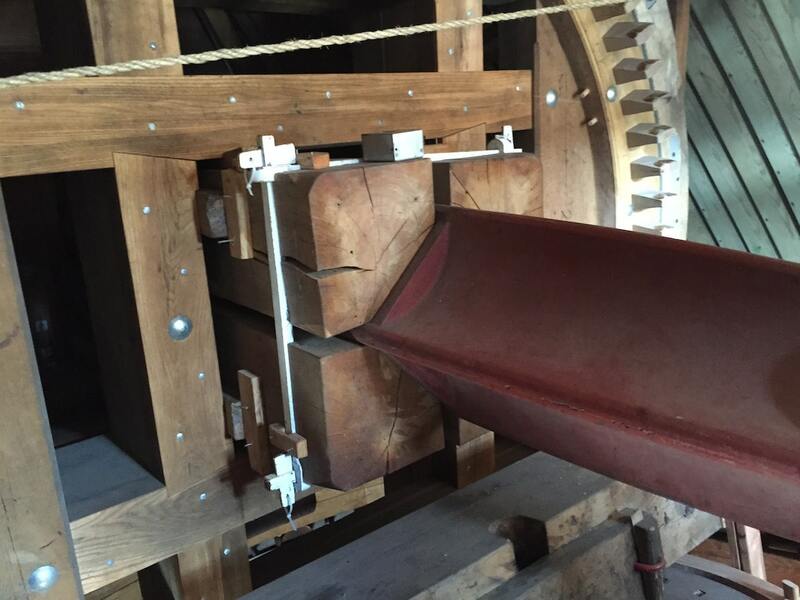 Although quite capable of functioning as a grain mill, De Adriaan is mainly a demonstration mill. On the ground floor (of the tower) is a shop where you can buy tickets, coffee, tea or bottled water and cookies, mill souvenirs, postcards and printed information about windmills and De Adriaan. The 1st floor has educational and cultural functions. Here audio-visual presentations are running continuously: about Mills in general, or the Molen De Adriaan specifically. 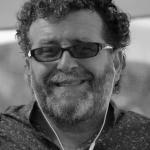 Always well received is the river Spaarne video. It’s as if you travel on the river and from the water looking at the most beautiful places and interesting buildings along the banks. The first floor can be rented for marriage ceremonies, dinner parties, business meetings, training sessions, including catering. 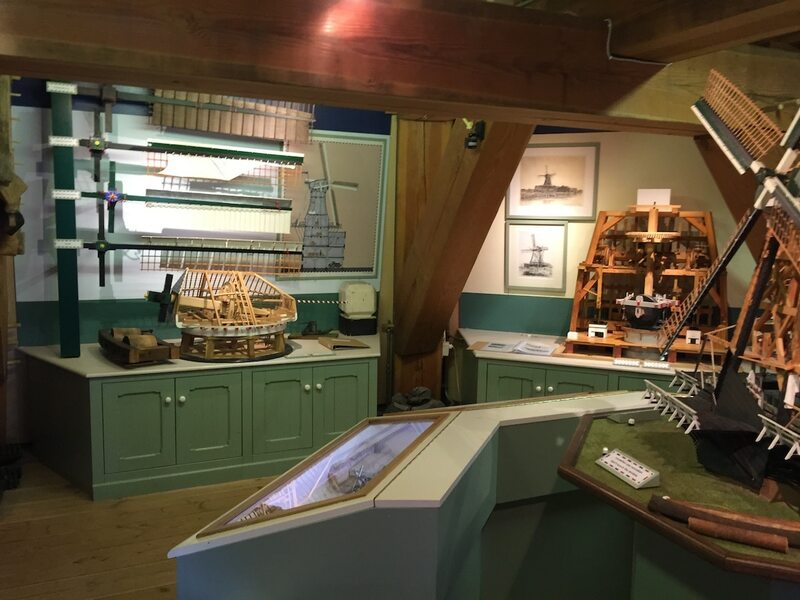 On the 2nd floor you can find a permanent exhibition about how windmills work in general and the different types of mills for grinding different materials, sawing wood and pumping up water from the polder. 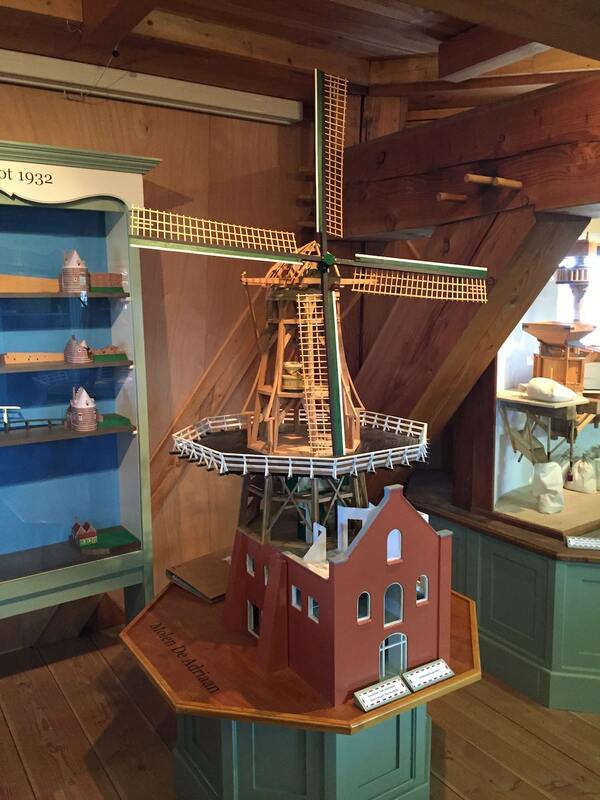 There is also an exhibition on the 3rd floor with a large model of Molen De Adriaan (see if you can point out where are you in the windmill), showcases of the materials ground in De Adriaan and even a handmill where you can try to grind some grain manually yourself. The 4th floor and upwards is the domain of the miller. Unforgettable is the time when you enter the platform: twelve meters above the river there is a spectacular view over the old town. On this floor you can also see short audiovisual presentations on trundling/wheeling (turning the mill into the wind), milling and changing the sails.